The Creekview features a kitchen with plenty of natural light flooding in from the covered lanai. The open first floor brings airiness to the kitchen, café, and gathering room with beautiful coffered ceiling. Add the loft option with bedroom and bath for additional space for family or guests. Step inside Creekview to see the Life-Tested Home Designs® with more usable space where you want it most. So you live the way you want to live. 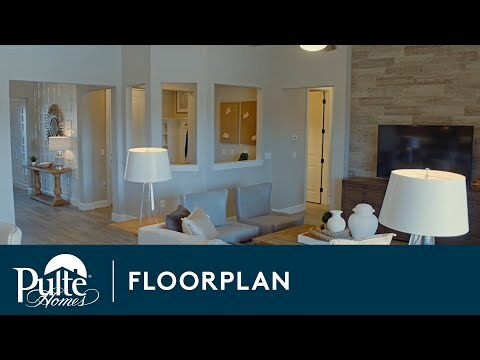 A double-foyer welcomes you into the Creekview floorplan. With the owner’s suite tucked away from the rest of the bedrooms and porcelain tile floors in the kitchen, this is a practical, yet elegant home design. The ability to add a loft with extra bedroom and bath makes the Creekview one of the most versatile plans around. A flex room off the foyer area could be used as an office, den or additional bedroom. The one-story Creekview stands out for its spacious design and storage solutions, with an open concept kitchen and Pulte Planning Center®. The private owner’s suite, featuring double sinks and a large walk-in closet, is the perfect oasis.